Everyone’s favorite Number 1 Blue Engine and the Island of Sodor came to life on Friday, July 27, 2018 with the grand opening of Thomas Town™. 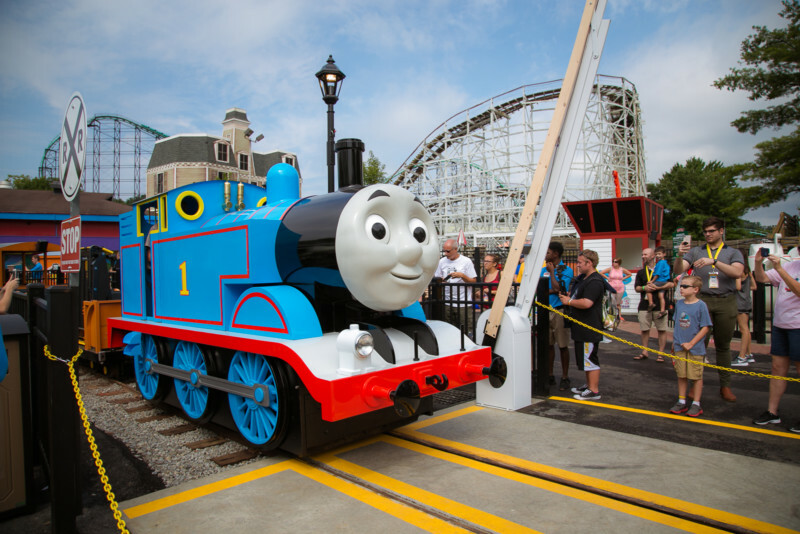 Located within Kennywood Park, Thomas Town features five rides including a train ride with Thomas, a live stage show, themed play and entertainment areas, retail store and more. It is the second-largest permanent Thomas & Friends™ attraction in North America. Journey with Thomas: Head to Kennywood Station and climb aboard for an unforgettable journey with the Number 1 Blue Engine! Guests of all ages can hop aboard a train ride with Thomas featuring wondrous views of the Monongahela River and the Edgar Thomson Steel Works, the oldest steel mill in the Steel City. Cranky’s Drop Tower: Strap in tight for a truly Cranky experience! Sodor’s strongest crane will lift you high above Thomas Town, and then drop you down. Harold’s Helicopter Tour: All set and ready for action! Kids can jump inside their own Harold Helicopter and pilot him up and down as they spin round and round. Flynn’s Fire Training: Junior firefighters shoot water to extinguish flames on this unique, interactive ride with Flynn. Steel City Adventures Live Show at Tidmouth Sheds: Join Percy, James, Emily, Gordon, Sir Topham Hatt for story and song as they prepare for an important journey to Pittsburgh. For more information and tickets to Thomas Town™, visit http://www.kennywood.com/thomastown.